Thanks to your feedback, Swimia has turn into in just many months one probably the most important web sites of swimming pools. Here you have all of the info we know about Frei- und Hallenbad Uhingen, in Uhingen. Do you know the opening hours? Are they offering any course? What's the cost for a single swim? 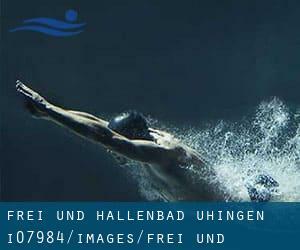 Don't neglect you can also promote this pool so Frei- und Hallenbad Uhingen will appear the first of Uhingen, or even the very first of your country, contact us to know additional. Swimmers like you reported 25 meters, 6 lanes, Indoors. Unfortunately we do not have the e-mail address of this Pool, but we can provide you with the phone number. If you believe that any from the facts is incorrect, please make contact with us. Help us be better day-by-day. Updated on 2019 Brucknerstraße 14 , Korb , GERMANY (Postal Code: 71404). This sports center offers 25 meters, Indoors. For this Swimming Pool, only phone number is number here. Updated on 2019 Hagäckerstraße , Kemnat , Ostfildern , GERMANY (Postal Code: 73760). Swimmers like you reported 25 meters x 8 meters, 0.8 meters - 2.0 meters depth, 0.8 meters - 2.0 meters depth, Indoors. Phone number and e-mail address are number for this Pool. Updated on 2019 Klosterstrasse 12 , Sindelfingen , GERMANY (Postal Code: 71063). Swimmers like you reported 25 meters, 4 lanes, 3.15 meters maximum depth, 3.15 meters maximum depth, Indoors. Unfortunately we do not have the email address of this Pool, but we can give you the phone number. Updated on 2019 Berliner Straße 32 , Maichingen , Sindelfingen , GERMANY (Postal Code: 71069). Among all of the activities provided by the center, if you are interested in swimming you'll appreciate 25 meters, 5 lanes, 3.4 meters maximum depth, 3.4 meters maximum depth, Indoors. If you need to contact this Pool, e-mail address and phone number are both number. Updated on 2019 Auf der Insel , Zizishausen , Nuertingen , GERMANY (Postal Code: 72622). This sports center offers 25 meters, 5 lanes, Indoors. For this Swimming Pool, only phone number is number here. Updated on 2019 In the SI-Centre , Plieninger Strasse 100/1 , Stuttgart , GERMANY (Postal Code: 70567). This sports center provides 20 meters, Indoor/Outdoor. Contact information for this Swimming Pool like phone number and e-mail address are number. Updated on 2019 Friedrich-Pfennig-Straße 24 , Heidenheim , GERMANY (Postal Code: 89518). This sports center offers Olympic size x 21 meters, 10 lanes, Indoors. Contact details for this Swimming Pool for example phone number and email address are number. Updated on 2019 Badstrasse 8 , Muenster , GERMANY (Postal Code: 48149). Among all the activities offered by the center, should you be interested in swimming you will take pleasure in 25 meters x 12.5 meters, Indoors. Just in case you would like to contact this Swimming Pool before dropping by, we only know the phone number. Updated on 2019 This sports center delivers 25 meters x 12.5 meters, 0.9 meters - 2 meters depth, 0.9 meters - 2 meters depth, Indoors. For this Pool, only phone number is number here. Updated on 2019 Dr.-Friedrich-Arnold-Str. 5 , Eschenbach , GERMANY. Swimmers like you reported 25 meters, 5 lanes, 1.8 meters - 2 meters depth, 1.8 meters - 2 meters depth, Indoors. Unfortunately we do not have the email address of this Pool, but we can provide you with the phone number. Updated on 2019 Hauptstraße 50 , Gerlingen , GERMANY (Postal Code: 70839). Among all the activities offered by the center, if you are enthusiastic about swimming you will delight in 25 meters, 4 lanes, Indoors. Just in case you want to contact this Swimming Pool just before dropping by, we only know the phone number. Updated on 2019 An der Talaue , Waiblingen , GERMANY (Postal Code: 71334). Among all the activities supplied by the center, if you're thinking about swimming you will appreciate 25 meters, Indoors. Just in case you would like to contact this Pool before dropping by, we only know the phone number. Updated on 2019 Am Hexenbuckel 1 , Boeblingen , GERMANY (Postal Code: 71032). This sports center offers 20 meters, Outdoors. Contact information for this Swimming Pool similar to phone number and email address are number. Updated on 2019 Hohenzollernstraße 23 , Sindelfingen , GERMANY (Postal Code: 71067). Swimmers like you reported Olympic size x 21 meters, 8 lanes, 1.8 meters maximum depth, 1.8 meters maximum depth, Indoors. Phone number and e-mail address are number for this Swimming Pool. Updated on 2019 Jahnstraße 14 , Weil der Stadt , GERMANY (Postal Code: 71263). This sports center provides 25 meters, 3 lanes, Indoors. For this Swimming Pool, only phone number is number here.